Nowhere else in this city is the layering effect of Rome's history more evident than in this 12th-century church built atop a 4th-century church built atop a late–2nd century pagan temple. 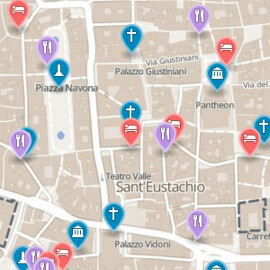 This situation is far from unique in Rome—almost the entire city is built directly on top of the ancient one—but what's special about San Clemente is that you can actually clamber down into those lower levels to explore Rome's sandwich of history. Even without that, the upper church—built in 1108 and run by the convent of Irish Dominican monks who rediscovered the lower levels in the 19th century—is beautiful enough to stand out on its own. 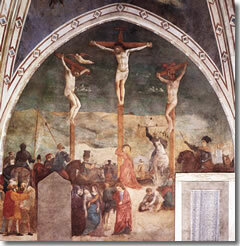 It features a pre-Cosmatesque pavement, ornate marble choir (a 6th– to 9th-century piece that came from the lower church), recently restored frescoes of the Life of St. Catherine (1228) by Masolino and his young disciple Masaccio in the first chapel on your right as you enter. 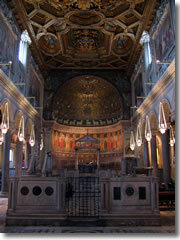 A 12th-century mosaic fills the apse with a Triumph of the Cross. This mosaic shows a crucified Christ in the center with the Tree of Life growing in twisting vine tendrils all around, loaded with medieval symbolism. Christ and the Apostles pose as sheep along the bottom, the Rivers of Paradise flow from the base of the cross from which the faithful, represented by stags, drink, doves flutter about, and the Hand of God reaches down from the canopy of the Heavens. 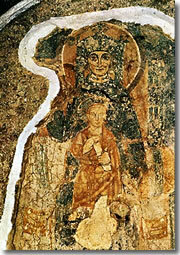 A 6th century fresco in the Lower Church, showing either a Madonna and Child or the Empress Theodora. Off the right aisle is a postcard-lined passageway and the entrance down to the lower church, built in the 4th century and largely demolished by Barbarian sackings in 1084. It preserves a few crude frescoes from the Paleo-Christian era, including the Life of St. Clement on the wall before you enter the nave and the Story of St. Alexis on the left wall of the nave itself. 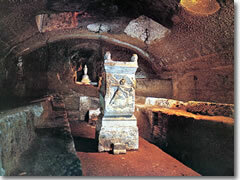 The altars of both later churches are placed directly above a Mithraeum with an altar of a pagan Temple to Mithras from the AD late 2nd century. Peer through the grating and you'll see that the altar itself depicts the god sacrificing a bull. As part of their rituals, Mithraic priests would also sacrifice bulls until the blood flowed into troughs, which followers would then scoop out with their arms to bathe in. Sounds nasty, but back in the day it was a hugely popular cult—certainly it had far more acolytes in the first few centuries AD than another of the many nascent cults swirling around Imperial Rome: Christianity. Next to this temple are the buried remains of an intact Roman palazzo of the AD 1st century. As you wander in and out of the brick vaulted rooms of Flauvius Clemens' grand palazzo, you'll hear the sound of rushing water from the ancient pipes and aqueducts between the walls. In one room you can even take a drink from the sweet spring water gushing out of an ancient pipeline to be routed along a small aqueduct set into the wall. How long does San Clemente take? You can attend services at San Clemente Monday to Saturdays at 8am and 6:30pm; Sundays at 9am, 11am, and 6:30pm.